So far I think things have been going quite well for my year-long sewing challenge – this dress is the third essential item completed. I knew I wanted to make this dress as soon as I saw it in last July’s Burda, but it took me a while to gather the materials and get around to making it. Overall I am pretty pleased with the dress – I like the style and I think the fit turned out pretty good overall. I think the dress is a great LBD – perfect for accessorizing, stylish, but simple. I feel like I could wear it to many different events, and I actually think it is pretty comfortable as well. I didn’t get to do a lot of styling for my photo shoot as my photographer wanted to take a nap, but I was able to get pictures of the basic dress. Also, I just want to point out that it looks super wrinkly in these pictures, but it looks much less noticeable in real life. I really messed with the contrast so it wouldn’t look like a black blob in the photos, but it makes the wrinkles look awful and huge when they really aren’t. Note to self: must stop doing photos of black fabric at twilight lest they turn out hard to see. The front of the dress. My lining and lace tape at the hem. Invisible zip was pretty good. I am glad I decided to include the sleeve bands for this dress. Pattern Description: A fitted sheath dress with side zip, side slit, and sleeve details. This pattern also includes a capelet or shrug to be worn over the dress. I only made the dress. Pattern Sizing: Burda sizes 36-44. I made a size 40 at the top and a size 44 at the bottom, but I did have to make a lot of adjustments (mostly taking the dress in everywhere) because I wanted this dress to be very fitted. Were the instructions easy to follow? Yes, I thought they were very easy – especially for Burda! The only part I think could be confusing is attaching the facing to the dress at the sleeve seam. I was really tired when I got to that step, so I just left it for the next day. It isn’t that difficult – you essentially turn the sleeves inside-out as much as possible and sew these pieces together. I was actually able to do this entire step on my machine, though it looks like the instructions assume you won’t be able to get the sleeves turned enough and has you finish this by hand. I thought this gave a nice finish to the sleeve seams, though I am sure there are other methods available. The rest of the instructions are very easy – you are mostly just sewing the long seams of the dress together. Did it look like the photo/drawing when you were done with it? Yes, almost exactly! I even made the dress in black, so it looked like it could have been the same dress – although I do think the sleeve bands were a bit more pronounced on me than in the model photo. What did you particularly like or dislike about the pattern? Likes: I love the style, I like the side slit because it makes the dress easy to walk in, and I like the side zip because it is easy to put on. I also think the instructions are great and this would be a good first Burda pattern for someone who is a bit nervous about the instructions. Dislikes: I don’t like that the front facing stops at the fullest part of my bust. It creates a sort-of visible line there, and I would prefer if it were a bit higher. Fabric used: I used a cotton sateen with slight stretch which I ordered from Mood online. I also added a lining (not part of the pattern) and I used a black Ambiance Bemburg Rayon, which I miraculously found (on sale!) at Joann Fabrics. I also used some nylon hem lace for hemming the dress. Pattern alterations or design changes you made: Well, I did make sort of a lot of alterations for fit I guess. I have a bit of a swayback and I have large thighs, but a comparatively small waist, so what I did was make a muslin, fit it to my body with pins, mark out the excess fabric with a Sharpie, and then adjust my paper pattern based on the fit problems with the muslin. Basically I took out width in the waist on all pattern pieces, took out some with across the upper back (original muslin had a gaping neck, but I took out the width at the seams), and took out some length (about 1 inch) at the upper back. I think this length adjustment is really due to my swayback, but because of the way the back seams are curved, it pushed the excess fabric higher up than I normally see in patterns I need to adjust. As for design changes – I added a lining (created my own pattern pieces by laying the facing and dress pieces together, then tracing that to draft the lining pieces), I used a 22″ invisible zipper as opposed to a 16″ zipper (mostly due to zipper availability, though I like the extra room fot getting into the dress), and I raised the neckline by about 2.5″. 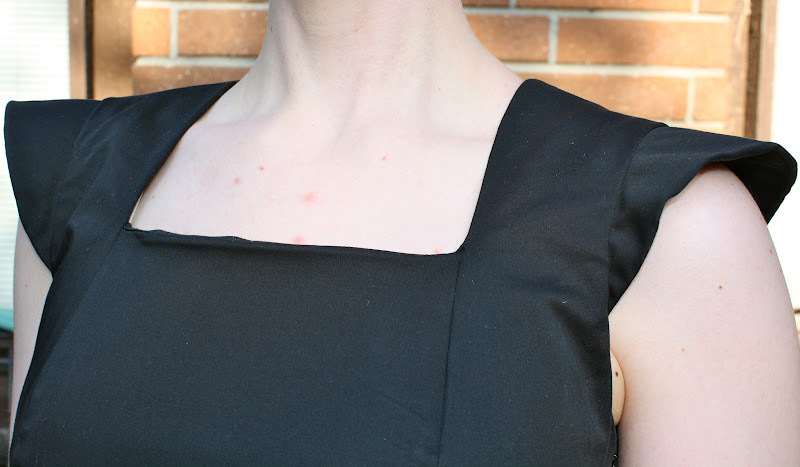 Apparently I have a slightly high bust, and Burda does love those low necklines. As drafted this pattern would be great for a date night, or if you are feeling the need to have a bit of revenge on your ex, but for a more versatile dress I think it is too revealing. The only problem I had with my adjustment is that I adjusted the facing neckline just a smidge too tall, so it tries to puff up a bit at the top. If you make this adjustment keep the facing line just a bit shorter than the dress line so it will stay in place. 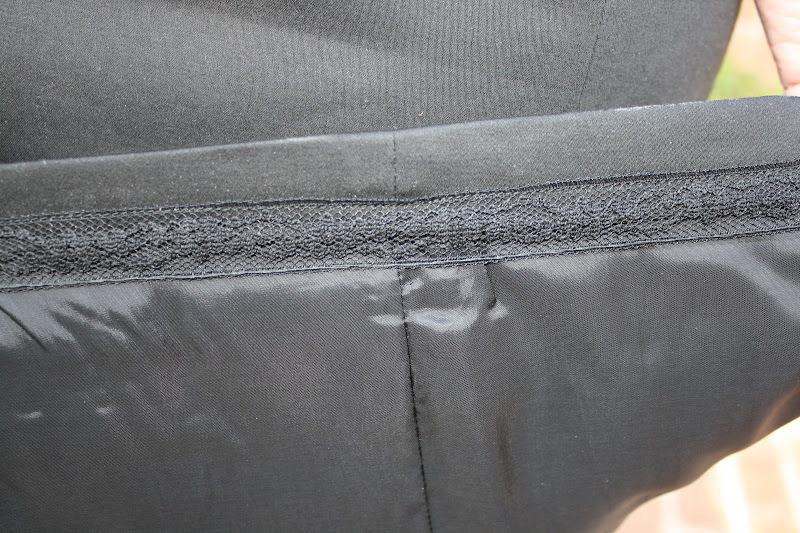 Would you sew it again? Would you recommend it to others? Yes, I think I might use this pattern again. I don’t make a lot of dresses, but I do like the way this dress fits since I made all the alterations. I think if I made it again I would (1) lower the neckline by 1/2″ (and then find appropriate undergarments for this), (2) change the front facing so it doesn’t hit at the full bust and lower the top a bit as well (and also adjust my lining pattern accordingly), and (3) probably leave off the sleeve bands/sleeve caps. I love them on my black dress because I think they make the dress more chic or stylish or something, but I also think this dress could be more versatile for wearing with jackets and such without them. I highly recommend this pattern to others, but I suggest you take the time to make a muslin because it is so fitted. This pattern required much more fit adjustment than I usually need with a Burda, but I think the results were totally worth it. Conclusion: Fabulous pattern! I think this is a great sheath pattern, and might be headed towards TNT status. The style lines are great, and help a lot with getting that perfect fit. The instructions are easy, and even someone new to Burda could follow them. If you are willing to put in a little effort with fitting a muslin, I think that the results will be fabulous and that this style could be very flattering for lots of body types. So I have another challenge item down. Well, actually two because my raincoat is also done! Keep an eye out – I will be posting my raincoat review soon! Wow! Fabulous dress. You must find every opportunity to wear it. I don't know why (maybe because of your potential shirt fabrics) but I think you should make another one – in purple, or a very dark pink. The black dress is lovely and fits you so well. Teal poplin will be fabulous as will purple! Just perfect for a LBD! Great fit, flattering, and versatile! I am not surprised you are considering making up this pattern again. It looks fab on you! I do really like this. Looks fab on you. Ah, yeah, seam allowances… The first Burda pattern I made I was just about to cut into the fabric (rotary cutter was poised and ready for business) and I looked and thought it was awfully small and remembered that Burda doesn't have seam allowances. Now I trace all my patterns (even envelope ones because I often make them in multiple sizes for me and my sister) and I have to remember to NOT add seam allowances to those. You seriously make all the same alterations as me and I am so totally making this dress based on how utterly slamming it is on you. Wow! TDF! Totally off topic – please don't tell me you are in the LA area. If you are I will feel awful to have not known or invited you for fabric fun! And I will have to insist next time! This is THE black dress. Totally gorgeous! 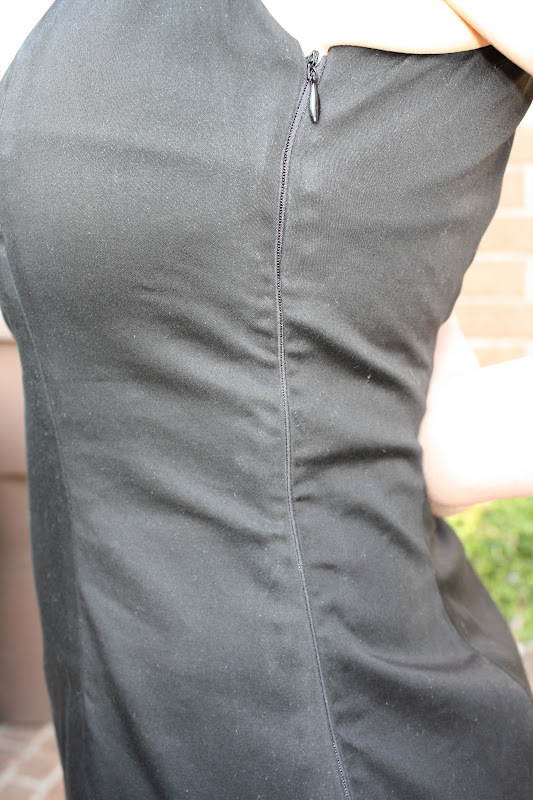 Pingback: The mindfulness dress: BurdaStyle 07/2011 #131 | He Cooks… She Sews!